When it comes to getting industrial parts from the manufacturing names your loyal to, there are plenty of options to choose from. Only one source puts you first. IBT Industrial Solutions focuses on what matters most: Your needs. Your business. Your success. We work hard to stay ahead in providing solutions to the grain industry. We pride ourselves on being grain product experts, matching parts to fit your application needs, as well as being dedicated partners, offering a variety of services to make your grain business run safer, smarter and more efficiently. So when you need a part, we understand that you have plenty of choices. But when you need someone who understands your business and genuinely cares about your success, you need IBT. At IBT, we are committed to ensuring our customers’ lives are easier for choosing to do business with us—and that doesn’t stop at top-quality products. We also employ the most highly trained staff—experts with an unparalleled knowledge of the products we offer—plus a dedicated sales force to help provide efficiency-boosting and bottom-line-driving services, as well. You can count on IBT to be there for you when problems arise, ready to provide the knowledge, guidance, and expertise you need to get back up and running right away. Let IBT assist you with your next bucket elevator overhaul. From a head section with urethane liner and UHMW throat plates, down to the boot section with spiral wrapped wing pulleys, IBT will help you select every piece for your grain bucket elevator based on your needs. Give us a call today! Elevator Buckets: Economic, High-Density Polyethylene, Nylon, Urethane. We also carry every line of elevator bolts, nuts and washers that you need, available in carbon and stainless steel. IBT stocks a variety of sheet goods designed to handle the abrasive nature of grain. Line your elevator Housings, Transitions, and Spouts with our array of premium liner products to reduce wear and lower maintenance costs. IBT stocks 4’x10’ sheets in a variety of thickness and compounds for your applications. All liners come in expanded metal back (EMB). With select sizes of fabric backed. Also available in solid metal back and plain backing. Special sizes are also available. Additional Abrasion Resistance, different compounds with added benefits. 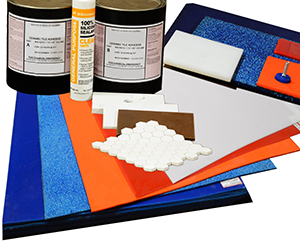 Ceramic Tile – Install these with either our industrial grade Silicone or two-part Epoxy kits. Ceramic chip epoxy grouts are available. WearPak 600 – This 2 part epoxy and ceramic bead kit is ideal for lining odd transition and unusual shapes. Our experts can help you select the best liners for your application, in stock and ready to ship. Give us a call if you’re in need of excellent impact or abrasion resistance. 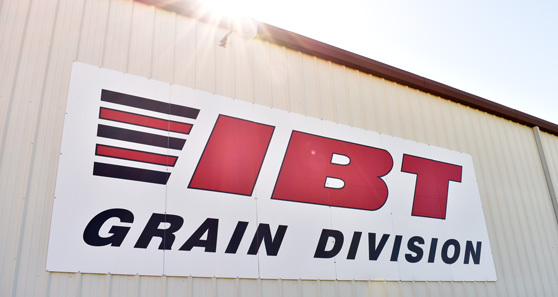 IBT offers the best in belting products, designed specifically for the grain industry. Our products are designed to withstand the harsh operating conditions of grain handling facilities. Whether you need belting for an elevator, storage or transfer, IBT has what you need. Belt Services: IBT Belt Technicians can modify belting and rubber goods in-house to your specs, including: Punched Holes, Cleats, Lugs, Sidewalls, Sleeves, Chutes, Die Cut Gaskets, etc. Our conveying systems team understands the importance of a reliable application and system design that provides high-performance, meets CEMA standards and achieves optimum efficiency. Drag Chain Conveyor Systems – Standard features include: Steel or cast iron sprockets, external-mount pillow block bearings, 12 ga. metal trough, 14 ga. flat weather covers, stress-proof shafts, UHMW paddles mounted on heavy-duty chain and UHMW return rollers. Screw Conveying Systems – Order from a wide selection of screw conveyor parts and accessories. CEMA-Compliant screw conveyors available in sizes ranging from 4″ to 24″ diameter and are available in a variety of designs, as well as materials. 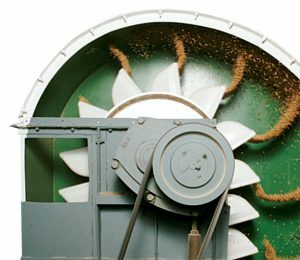 Grain business depends on the smooth efficiency of electric grain motors to keep systems up and running. Many grain elevators, rice mills, dust pellet mills, flour mills, feed mills, etc. 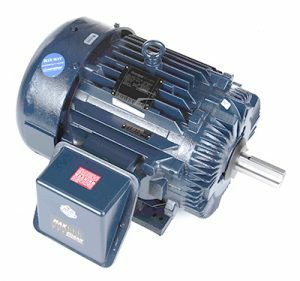 are home to some of the most demanding conditions and accident-prone environments for electric motors, therefore increasing the necessity for quality and safety. 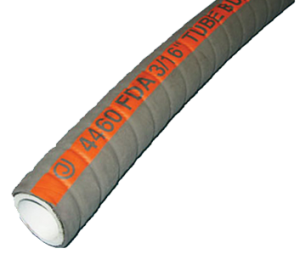 IBT maintains a vast inventory of industrial, hydraulic and material handling hose and fittings. We have the ideal hose for each medium – and for each hose, the right fitting. Heavy-Duty Polyurethane: Premium-quality material handling hose designed with a thick, smooth polyurethane lining. Full Custom Hose Assemblies: Custom size and length hose assemblies are available from our vendors along with standard and custom size spout/chute end sleeves and transitions. With IBT, you have a dependable source for a full line of grain safety products. 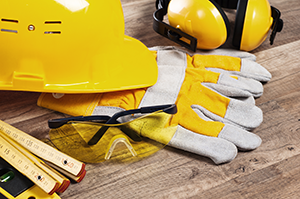 We have everything you need to provide a high level of safety in your workplace, especially one with as many hazardous conditions as the grain industry. We also provide comprehensive consulting and training services to assist your facility with regulatory compliance.